In my daughters' room I have 2 different sized beds, one is the average single sized bed and the other is a mini size bed for up to age 6. They have always had different bedding as you cannot buy the same bedding for the different sizes! I decided that I will make my own bedding so that the bedroom looks more co-ordinated! I decided to use the bedding I already had in the house to save me money on buying fabric! I measured the original duvets so I have a final measurement for each duvet. 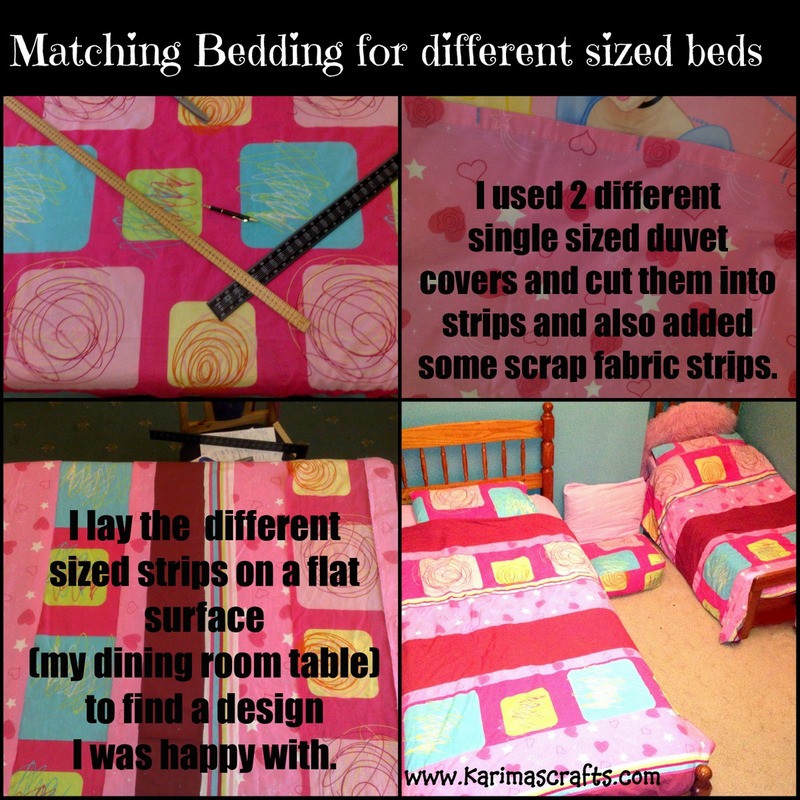 I cut the fabric into strips - Making sure there were enough strips matching for each duvet. I lay the strips out flat (I used the dining table) and find a design you are happy with. I then took a photograph of this design so that when I started sewing them I didn't forget the order they were in! I then pinned 2 strips together and sewed them together with the sewing machine. I then kept pinning each strip and sewing each one until all the strips were sewn together - you need to do this for each duvet cover. For the back of the duvets I used 2 different fabrics - as these are not seen when the beds are made and I was only using the fabric I already had in the home. If you were buying fabric then you could buy matching fabric for the back of the duvet covers! I then sewed together the front and back of the duvet covers - leaving a space at the bottom to insert the duvet. You could add buttons/velcro fastenings at the bottom of the duvet cover when you have finished. 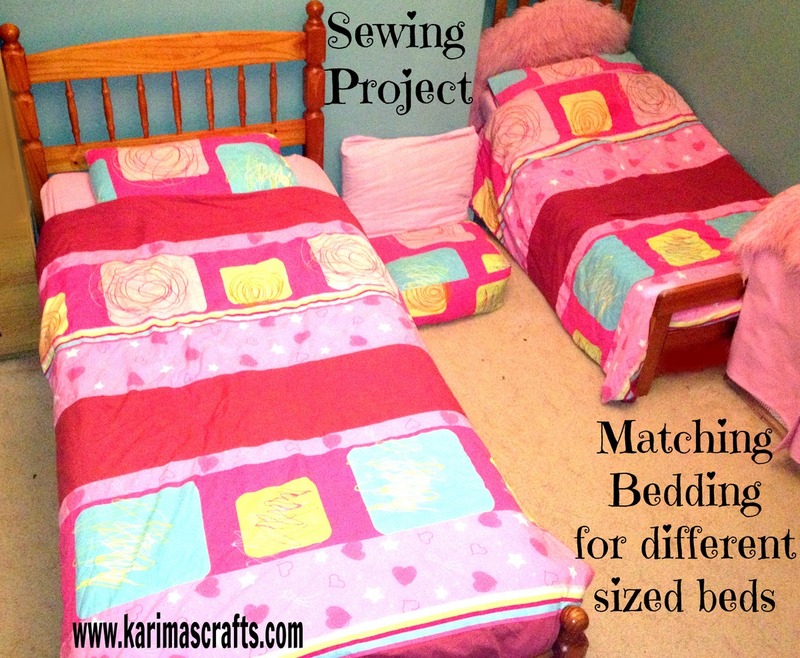 I also made matching pillowcases for the beds - one pillowcase I already had from the original duvet bedding set but I had to make another one for the other bed using the spare same fabric. I also made a matching pouffe using the same matching fabric - you can see that on the large photograph between the 2 beds. I have placed a pink cushion on top of the pouffe and I use this as a seat on an evening when I read a bedtime story to the youngest! I was really pleased with the final outcome, with the extra fabric leftover I also made some matching curtains to help co-ordinate the room - I will do a post about that later inshallah. I did use some extra fabric apart from the 2 original duvet covers - but only fabric I already had in the house - so this project didn't cost me any money!